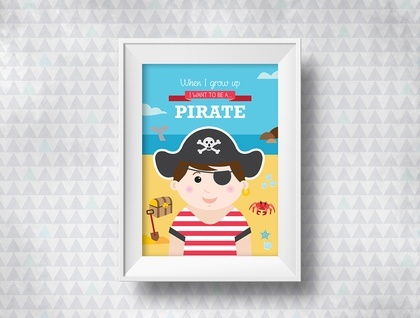 Let your child’s creativity and imagination run wild with this fun and brightly-coloured Pirate Print. Simply pop in a frame of your choice, hang and add instant impact to your desired space. Your print is packaged in a protective sleeve with cardboard backing and is safely shipped to you in a sturdy mailer. This original artwork forms part of a collection that illustrates a popular selection of what kids want to be when they grow up (both real and fantastical). Does your child dream of becoming a nurse or prima ballerina, want to live underwater or explore the African savannahs? Do they imagine a future of slaying dragons, sailing the seven seas or blasting off into outer space? Whatever your child dreams of becoming, a print from our When I grow up collection will make a stunning addition to their bedroom, adding colour, fun and charm. Be sure to check out my other designs for GIRLS: Ballerina, Mermaid, Nurse, Princess or Popstar or for BOYS: Cowboy, Explorer, Knight or Spaceman. 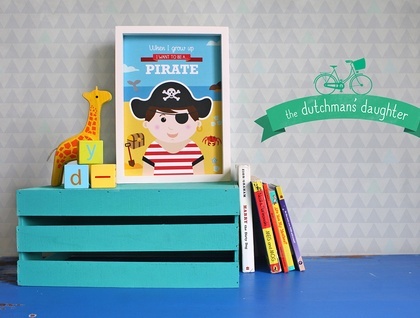 Why not match this Pirate Print with my colourful paper bunting too? See item #240317 in my shop. Contact dutchgirl to enquire about payment or shipping options.